Overcome by years of anxiety and depression on a fruitless journey to find himself, Casey Cease could not imagine his life getting any darker. On July 5th, 1995, at the age of 17, fueled by desperate anger and alcohol, Casey caused a horrific car accident that resulted in the death of his friend. Guilty and hopeless, Casey lay in a mental hospital on suicide watch, sure that his life was over. He would soon learn that God had a plan to rescue and redeem him through Jesus Christ. For over a decade, Casey has been traveling the country candidly sharing his testimony of God’s power to save others to a life of hope and peace, even when it seems they will be lost forever. With a pastor’s heart, he wrote Tragedy to Truth for the sole purpose of giving you the opportunity to marvel at the limitless love of God toward broken, sinful people. No matter how bad you think you are, you aren’t beyond the reach of Christ. The first half of this book, Tragedy, is Casey’s testimony, from his birth to the present. He shares details of his life that few others will in an effort to display God’s grace in his life. 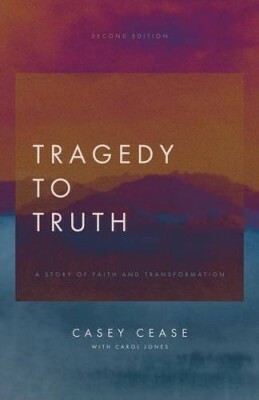 The second half of this book, Truth, shares the hope that Casey has found in many areas of his life through this tragedy. Tragedy is a reality in this lifetime, but through God’s grace it can lead to the truth.